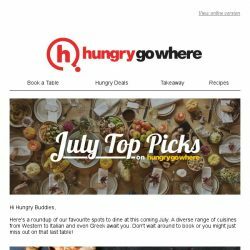 [HungryGoWhere] Breezy Al Fresco Dining at Lewin Terrace, Brussels Sprouts, Aqua Luna & more! 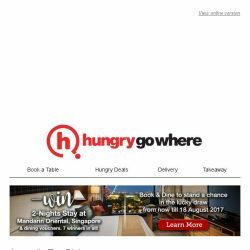 [HungryGoWhere] Stand a chance to win 2-Nights Stay at Mandarin Oriental, Singapore & Dining Vouchers! 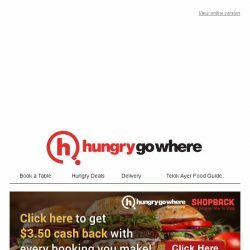 [HungryGoWhere] National Day Specials: 2nd Dines @ $0.52++, 1-for-1 Mains, 30% Off Total Bill & more! 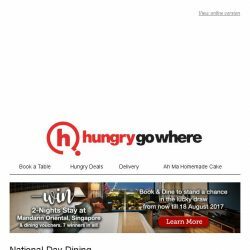 [HungryGoWhere] National Day Specials: 50% Off 2nd Lobster Porridge, 52% Off 2nd Mains, Buffet Lunch @ $52++ & more! 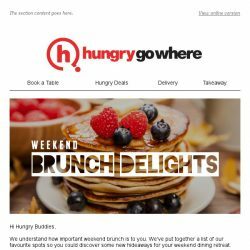 [HungryGoWhere] New Indulgences at Le Binchotan, Ramen Atelier, Jag’s Gastropub & more! 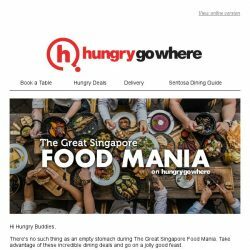 [HungryGoWhere] Epicurean Fusion Fare at SuperTree, Sunday Market, Ash & Char and more! 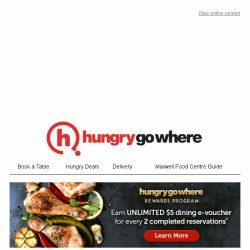 [HungryGoWhere] HungryGoWhere Exclusives: 1-for-1 Mains, 1-for-1 Set Meal, 25% Off Total Bill & more! 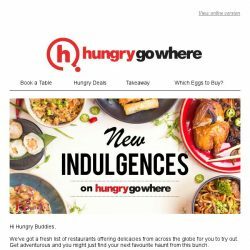 [HungryGoWhere] New Indulgences at Cha Thai, Verdure Café, The Flourist, Baba Chews & many more! 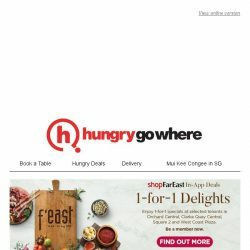 [HungryGoWhere] HungryGoWhere Exclusives: 1-for-1 Thai Train Fried Rice, Up to 30% Off Total Bill, 4th Main Course Free, Set Lunches from $19++ & more! 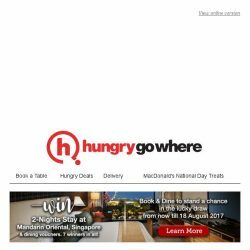 [HungryGoWhere] Win 2-Nights stay at Mandarin Oriental, Singapore & Dining Vouchers! 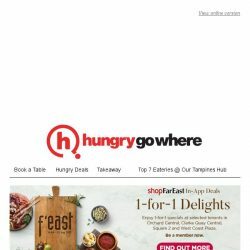 [HungryGoWhere] #Foodtography tips for your weekend dining at The Clifford Pier, Alati, Central Perk, Ding Dong & more! 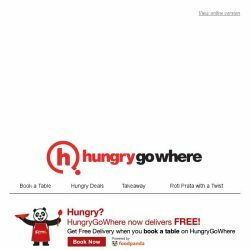 [HungryGoWhere] Cheers to a rocking Happy Hour with $1 Drinks, Free Sticky Wings, Bucket of 5 Beers @ $40 & more! 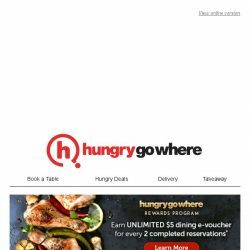 [HungryGoWhere] HungryGoWhere Exclusives: 1-for-1 Steak & Selected Mains, 3rd Set Lunch Free, 15% Off Total Bill & more! 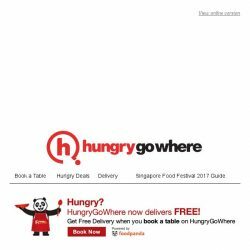 [HungryGoWhere] Dim Sum Galore at Summer Pavilion, Cherry Garden, Peony Jade, Hai Tien Lo & more! 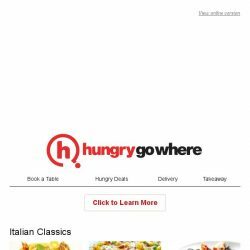 [HungryGoWhere] Our take on a Fantastico Italian fare that’s more than just Pizzas and Pastas! 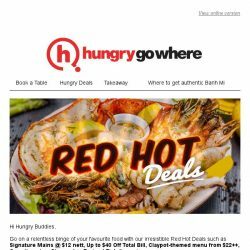 [HungryGoWhere] Red Hot Deals: Signature Mains @ $12 nett, Up to $40 Off Total Bill, Complimentary Steamed or Braised Fish & more! 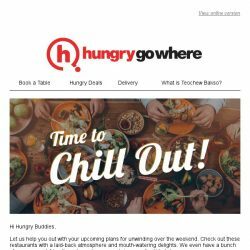 [HungryGoWhere] Chill out and unwind at Level33, Aqua Luna, Open Farm Community & more! 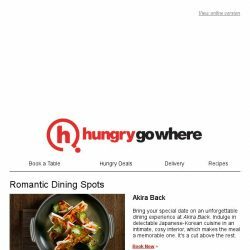 [HungryGoWhere] HungryGoWhere Exclusives: 1-for-1 Deals, 10% Off Total Bill, 50% Off 2nd Diner & more! 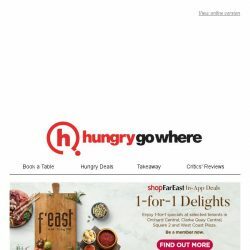 [HungryGoWhere] New Indulgences at Zaffron Banana Leaf, The Tavern Pub, Coriander Leaf Restaurant & many more!